I have been seeing the usefulness of teaching fact families at the middle school level. As a result, I have been thinking about how students look for and express regularity in repeated reasoning (Mathematical Practice 8) in a new way. The repeated reasoning that results from fact families is about inverse operations, addition and subtraction, multiplication and division. These inverse relationships continue to be repeated as students expand the types of numbers they use in their reasoning. 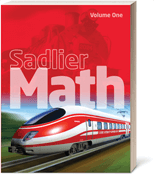 When this kind of reasoning can be repeated across the grade levels, it strengthens students’ thinking about these related operations and helps give them insight into the different kinds of numbers they will encounter later in middle school: fractions, rational numbers, integers, and scientific notation. 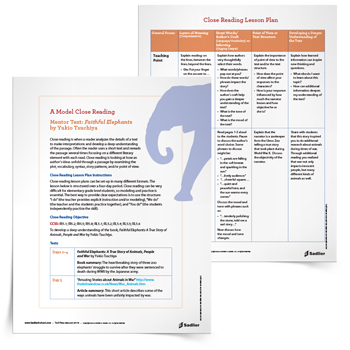 The ability to look for and express regularity in repeated reasoning through the use of fact families helps students to see the connections between what they learned in the past and what they are currently learning. WHAT I MEAN BY "FACT FAMILIES"
This understanding of fact families for addition and subtraction is in the Common Core Operations and Algebraic Thinking Standards for Grade 1 and the Grade 2 Number and Operations Standards. The multiplication fact families are first noted in the Grade 3 Operations and Algebraic Thinking Standards. 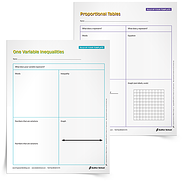 Students can first look for and express regularity in repeated reasoning by understanding that the addition/subtraction relationship learned in Grades 1 and 2 also holds true for developing understanding of the relationship between multiplication and division. 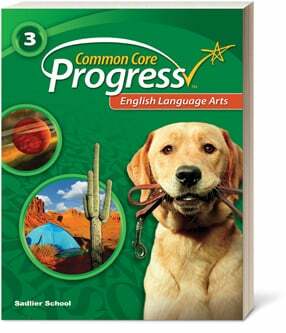 Although the idea of fact families are often left behind after Grade 4, students can look for express regularity in repeated reasoning by continuing to write fact families as they explore some of the more difficult concepts in the middle school curriculum, such as dividing by fractions, subtracting negative numbers, and finding growth factors. 35 ÷ 5 = ? (1.2 x 10-2) ÷ (3 x 104) = ? If you are a coach or a curriculum coordinator, you have a real opportunity to highlight how this previously-learned idea can be brought to the higher grades. You can use the download from this post to show upper grade teachers how to apply this form of repeated reasoning to their grade levels. 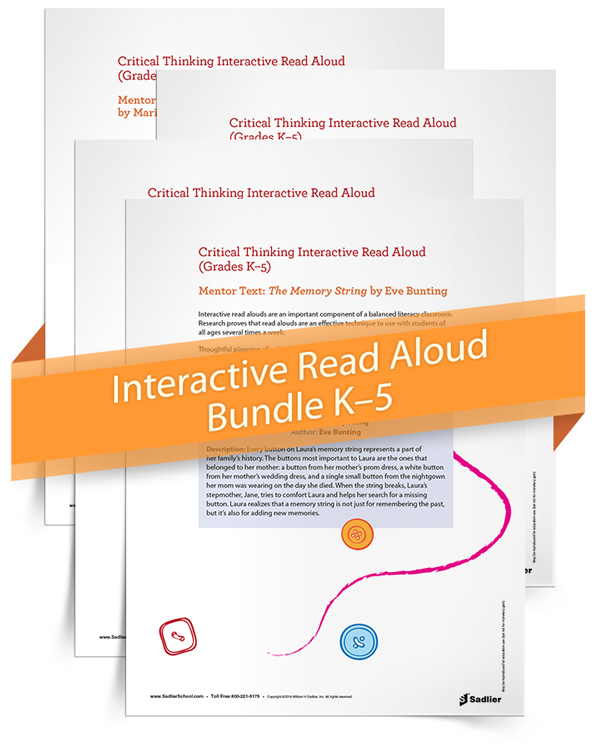 When students look for and express regularity in repeated reasoning through the use of fact families, it helps students to see the connections between what they learned in the past and what they are currently learning. 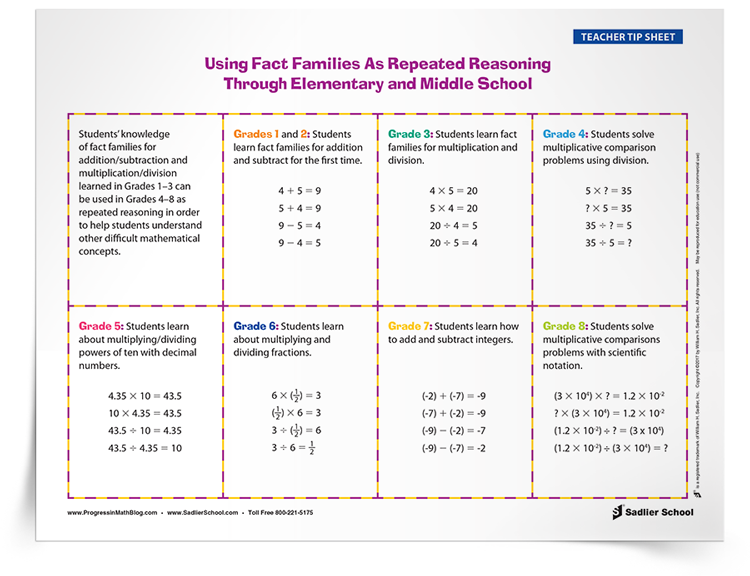 Download a tip sheet to see examples of how I use fact families to help students look for and express regularity in repeated reasoning in order to help learn these concepts. 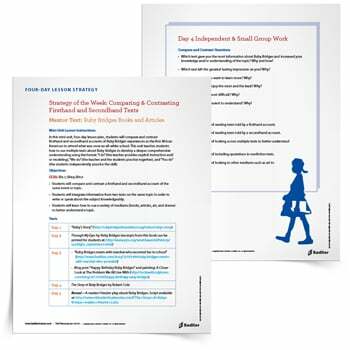 This is the last in a series of eight blog posts from this year that discuss the use of Standards for Mathematical Practice in elementary and middle school classrooms. 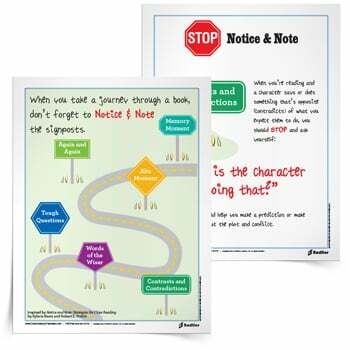 If you missed these posts, you can find links to the past downloadable tip sheets below. 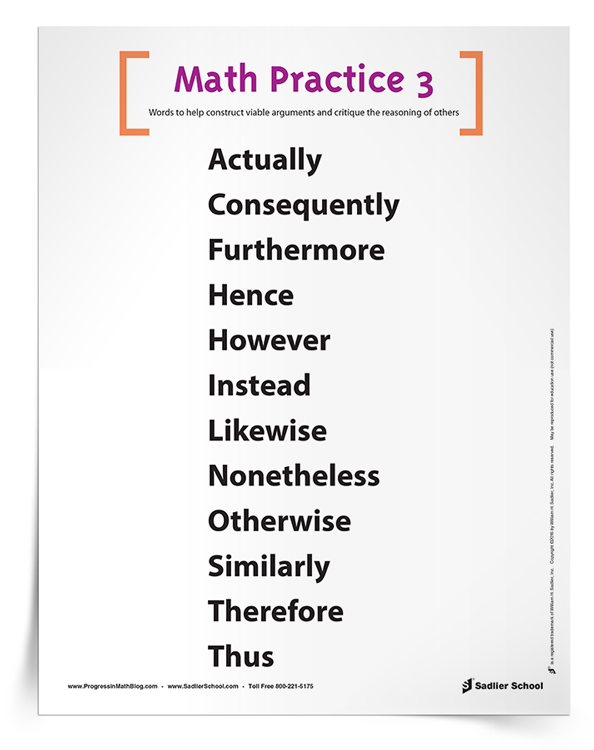 Print one out and bring it to your next meeting with math teachers to engage them in discussion about how to use the Standards for Mathematical Practice in their classrooms.